It's finally Friday!! Happy weekend to all of you! I have been dreaming of Spring with the unusually warmer temps we've been having in DC this week, and I am so ready to officially be able to wear some lighter layers! So, I thought there was no better time than now to reveal a few things I have on my radar for the upcoming season. Clearly, there's a blush trend going on here, and if you can't already tell from my website design - blush is one of my favorite colors! With Valentine's Day right around the corner, it's time to treat yourself to a touch of pink! I am loving this multi-colored off the shoulder top, but I know the price is high! I found the cutest top that is so similar for a fraction of the price here (insert praise hands emoji!!) that I actually just ordered yesterday! It will be hitting the blog soon, so I hope you love it as much as I do! However, I have heard rave reviews over the tops from Caroline Constas, and I am hoping to add one of them to my collection this Spring. But, let's be honest - there's nothing better than finding a similar style of a piece you're coveting for a fraction of the price! Sunglasses: Sold out, similar here | Lips: Nars in "Unspeakable"
Happy Wednesday! 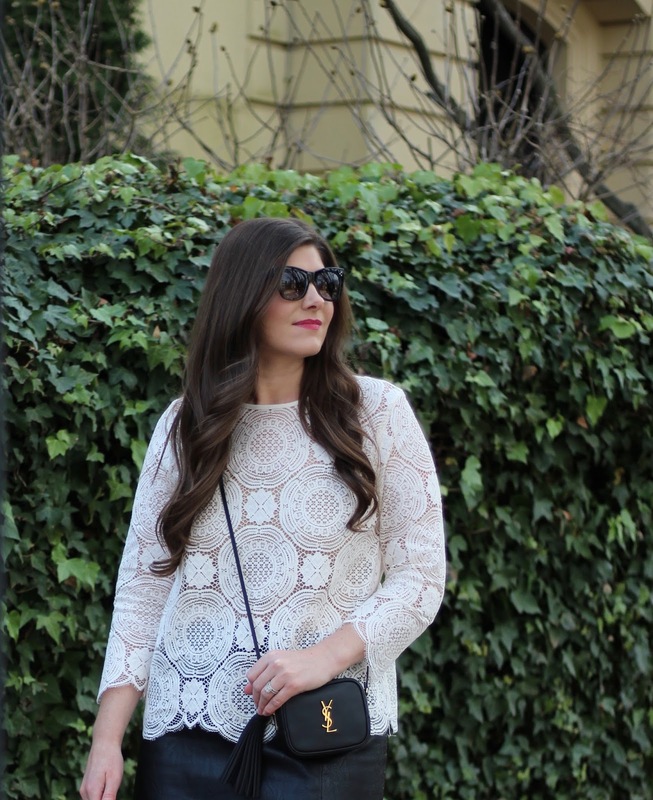 Today I wanted to share this gorgeous lace top that I found at Loft while home for the holidays. I was stunned when I spotted this top for under $60! It would transition perfectly into spring paired with distressed denim or this fab denim skirt. I am craving Springtime and sunshine so badly!! The high in DC for today is 60 degrees, so fingers crossed that Spring will come early! I plan to share some of my Spring cravings on the blog on Friday, so be sure to check back at the end of the week! Sunglasses: BP. Nordstrom, sold out but love these! Happy Monday! Can you believe we are halfway thru January!? No complaints here, because it means the closer we are approaching Spring! I have come to love Fall and Winter and all of the layers they bring, but there is no doubt the fun prints and colors in the Spring win over my fashion-loving heart! You might remember this same skirt in this deep bordeaux color from this post. I have reached for it so much that I decided I needed it in this taupe color, and I'm loving it mixed with other neutrals. Grey, taupe, and black are just so chic to me when paired together. 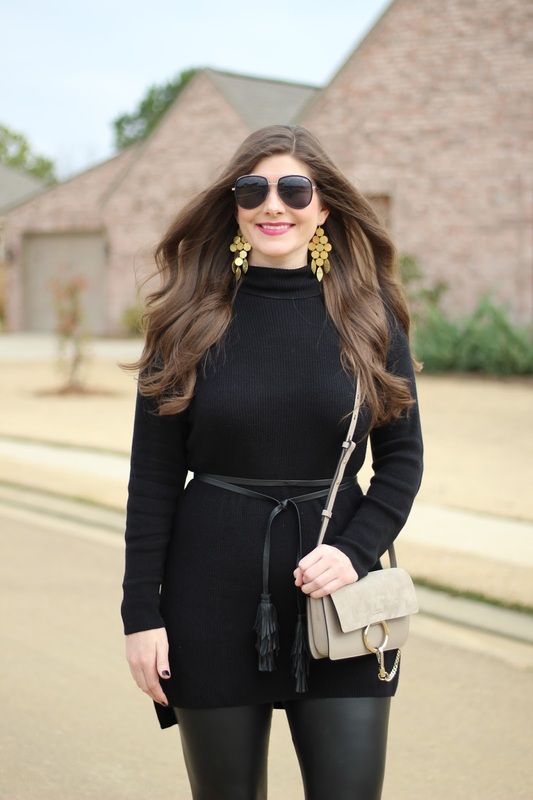 The best part is that this ruffle sleeved sweater gives this neutral toned look a little sass. 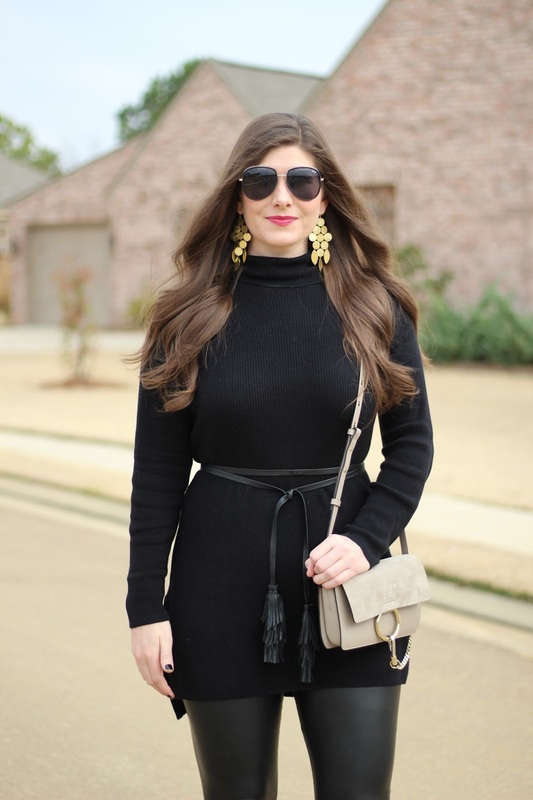 I am loving all of the exaggerated sleeves I'm seeing lately, and I can't wait to carry the trend right into Spring with tops like this and this. I hope you have a great Monday and a productive start to your week!! Happy Wednesday!! I am getting so excited for the long weekend coming up with MLK day being on Monday! Today, I wanted to share this cape that I'm loving right now. Hopefully, this look will inspire you a little bit to venture outside of your comfort zone! This is the first time I've worn a cape, but I am obsessed! Such an easy piece that instantly makes a statement! I linked a similar cape that I came across, but there are so many great options here as well. 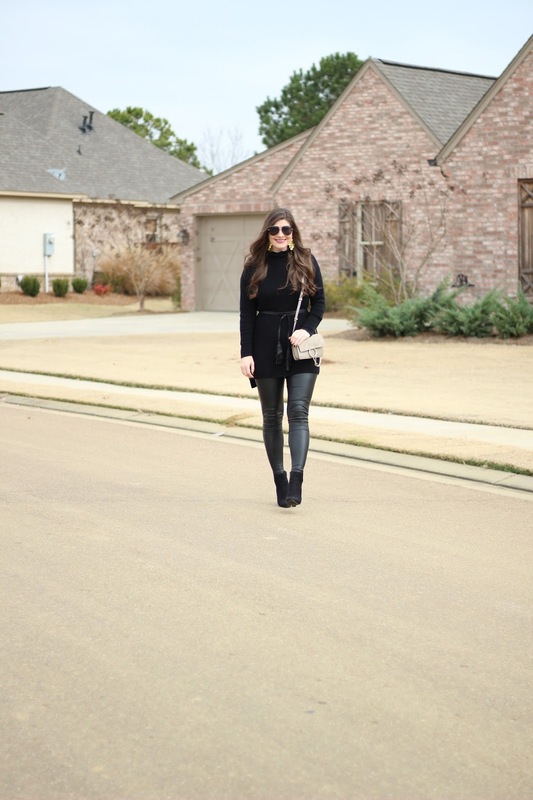 And, if I haven't convinced you yet, I am going to now - you NEED these faux leather leggings! Thanks for stopping by, and I hope you have a great rest of the week!! There are no words to describe how cold it was while shooting these photos, much less with the wind chill! However, I do love living in a city where we get all four seasons! This little faux fur coat was a purchase from Forever 21 last season, and this was honestly my first time to wear it. I spotted this version from Tularosa on Revolve, and it reminded me that I had this little coat tucked away in the back of our coat closet. 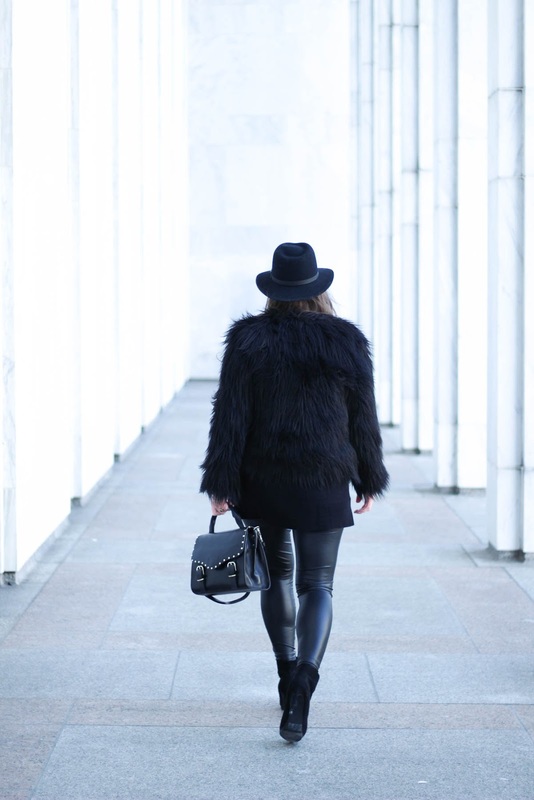 I cannot get enough of faux fur during these winter months, as it spices up my all black any outfit this time of year. I highly recommend adding a statement faux fur piece to your wardrobe. You will be surprised at how much you reach for it during these dreary, winter months! I hope your Monday is off to a great start! We had such a relaxing weekend. It was seriously too cold to step outside, but we managed to get a lot of errands completed to get ready for another week! As always, thanks for stopping by and happy Monday! Happy Friday, y'all!! What a week this has been getting back in the swing of things. I have had so much trouble adjusting back to my routine. Anyone else?? I think I totally checked out over the holidays, and all of a sudden it's like bam, welcome back to reality! Anyways, onto this look! I packed a lot of basics when we traveled home for Christmas, and I was amazed at how many outfits I was able to create with the same few pieces. You might remember these leggings and this same tunic sweater from Wednesday's post! Also, I majorly lucked out when visiting my bestie, Anna, when I was home! She offered me this cute belt and several of these little Nars lip glides that didn't work for her from this set! All of which I love... thank you, Anna! 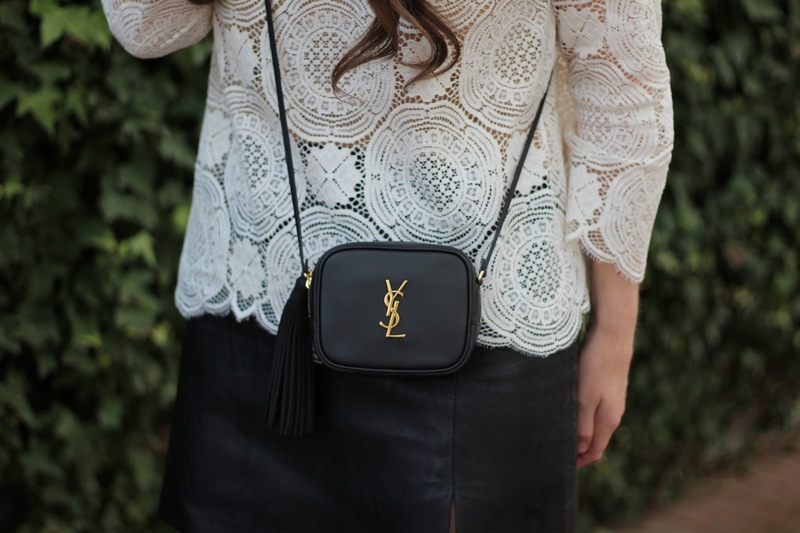 I adore a monochrome look mixed with different textures - so easy, yet so put together! 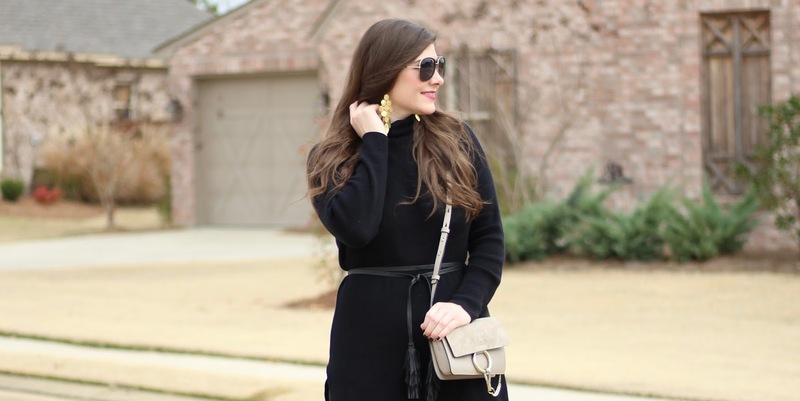 I decided to top off this look with these statement gold earrings and my grey Chloe bag. Mixing grey and gold tones is one of my absolute favorite combos... a marble countertop with gold/brass hardware in a kitchen is my dream! I hope you have a great weekend! We don't have much going on, and I couldn't be more excited about it after being gone for so long! Happy weekend! !